Hi friends! Happy Friday 🙂 This has been a quick week! I didn’t really feel well until Wednesday of this week, but I’m finally back in action. Dylan and I got out to shoot some blog photos Wednesday morning and were able to get caught up on a bunch of work. My parents are in town visiting from Indiana, so it’s been so nice to have them here. They typically come to Austin every January and stay 2-3 weeks with us. It’s so nice to spend so much quality time with them! Noah gets really close to them during this time, and they also help out with a little babysitting, which is amazing! 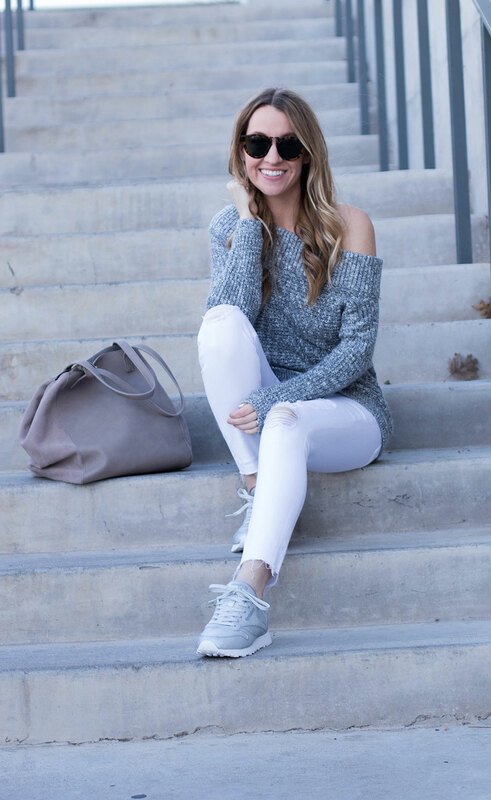 How cute is this off the shoulder sweater? I’m so in love with it! 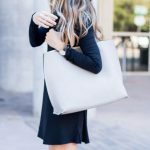 It’s sold out in grey, but it’s available in black, blush, and navy! It’s so cute in every color! I love wearing it completely off the shoulders or just off one shoulder. I love that it’s super adorable both ways! I also just picked up these white distressed jeans. I’ve been looking for a new pair for awhile, and I love these. They are high waisted, and I love how they have a little bit of distressing/fraying at the ankles. And lastly how uh-mazing are these silver Reebok sneakers!? They are so much fun! I’ve been looking for a great metallic sneaker, and I love the vintage style of these! Tonight Dylan and I are going on a little date night to see Mama Mia here in Austin. On Saturday we are working with Zappos to attend the Road Show Pet Adoption which will be fun! Do you have any fun weekend plans? I’m looking forward to having fun, and relaxing with family! So glad you’re feeling better and having family in town is so nice. Love this ots sweater! Definitely one of the cutest off the shoulder sweaters!!! Love the grey! I’m glad you are doing better! I am in love with that sweater! My favorite thing about off-shoulder tops is that they are super nursing friendly! haha You look great! You weren’t kidding, this really is the cutest off shoulder sweater, it looks so comfy! I Love how you styled it with those sneakers.. love!! Perfect look! I wish it was cold in Miami, even a little bit. I would love to be able to wear this outfit. Perfect head to toe! Love it. That is such a pretty sweater on you and I LOVE those silver sneakers! 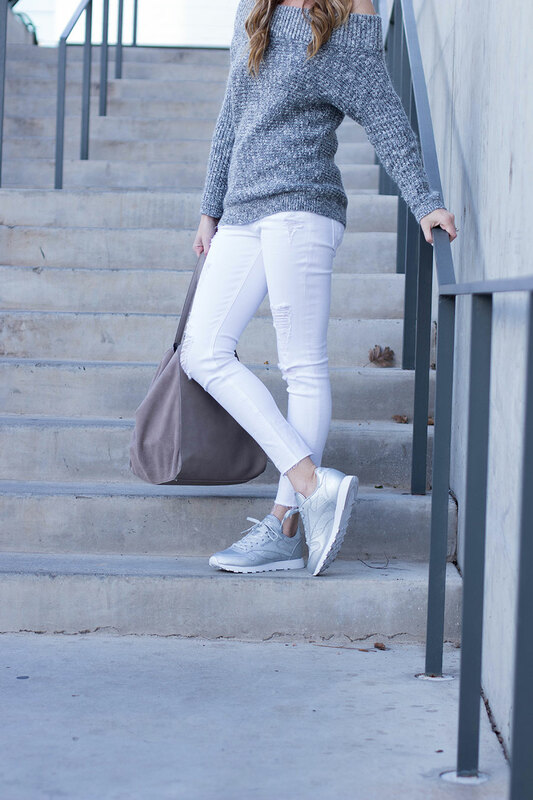 Love how you paired the grey, white and silver kicks! Too cute on you! I’ve always loved the off the shoulder style, you wear it well. Those silver kicks are everything! Love your whole look. It’s awesome that your parents came to visit you! I love that skirt so much! Have so much fun seeing Mama Mia! That is one of my favs! I love this sweater! This sweater looks incredible and so comfortable! 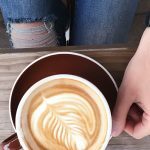 I LOVE it when you find a cute and comfortable outfit that is such a no-brainer! It’s all I can afford these days when time has become so precious! Love sweater and the whole look. I need those Reeboks! such a cute casual look, the sweater looks so soft and comfy! I LOVE your top! The color and knit are perfection, so beautiful! Love this sweater and those sneakers! Date night is my favorite 🙂 hope you had fun! You look GORGEOUS. That top is SO perfect! Love the tennies too. What a cute athleisure outfit! I love how that top can be worn off both shoulders, or just off one shoulder. Such a pretty marled gray! I hope you’ve had a great weekend! So comfy! I love those metallic shoes! This sweater is the absolute cutest!! You look adorable! I’m in love with this cozy sweater!